New owners Dave and Heather Saunders offer you a warm welcome to the Trout Inn, Beulah. The 2017 Christmas Party Menu will be available from the end of November until Christmas Eve. Please not that with Christmas fast approaching, available dates are now limited so please book ASAP to avoid disappointment. We have secure and undercover cycle storage and drying room for guests. Free WiFi available in the Pub and B&B. 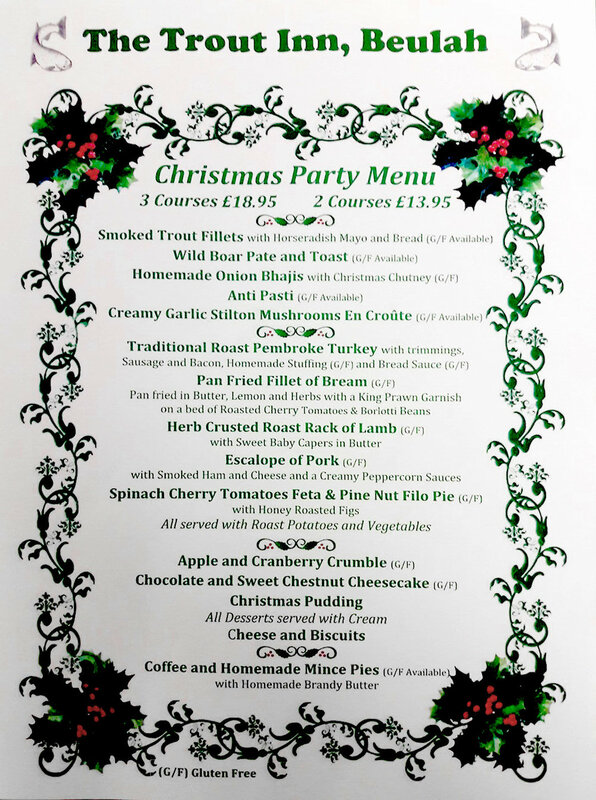 The 2018 Christmas Party Menu will be available from the end of November until Christmas Eve. Book ASAP to avoid disappointment. Come and join us at the Trout Inn to celebrate easter. Many thanks for your enquiry, we will be in touch as soon as possible.